John Lydgate (died c. 1450) was a monk at the abbey of Bury St. Edmunds, and translated the 'Lives of Sts. 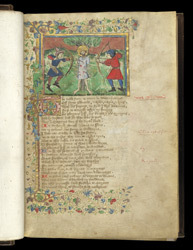 Edmund and Fremund' from Latin into English to commemorate the visit of King Henry VI to the abbey in 1434-1435. The artist of this volume was probably a member of a workshop based in the town. Before being beheaded, St. Edmund was tied to a tree and shot full of arrows by Viking invaders, and his most common identifying attribute in medieval art is therefore an arrow.